When snakes in the wild go into hibernation depends on two things: their location and their species. A snake in Minnesota will go into hibernation much earlier than a snake in Texas, and come out of hibernation much later. Snakes from tropical climates, such as pythons and boas, don't hibernate at all. Venomous snakes from North America, such as rattlers, copperheads, and cottonmouths, hibernate when the weather cools down. Snake activity picks up as temperatures fall in late summer and early autumn before they go into hibernation, which can be as early as September or as late as December. Generally, rattlesnakes emerge from hibernation in March or April, or when the average daytime temperatures reach and remain about 60 degrees Fahrenhei t and higher. In warmer southern states, snakes often don't go into hibernation, but brumation. Hibernation is a deep sleep, usually occuring in colder, snow covered climates in northern states. Snakes don't actually sleep in Brumation, but their bodies acclimate to a lower temperature, their metabolism slows, and they become less active and less inclined to feed. Brumation or hibernation is necessary for breeding. If male snakes don't cool down at some point during the year, they most likely would not be able to produce fertile sperm. On warm days, brumating snakes sometimes come out of their dens to bask in the sunshine. Nice sunny winter days that follow a long cold snap are often when people are surprised by snakes. Just like humans, snakes head out to enjoy the sun and unsuspecting hikers can startle them and cause them to strike. As a rule of thumb, rattlesnakes can strike a distance of two-thirds their total body length. That means a three foot long snake may be able to strike a distance of two feet. Rattlesnakes cannot jump. If striking downhill, however, gravity and the momentum generated by a strike may combine to carry the animal farther forward than would occur over flat ground. On very steep slopes, a snake could lose balance during a strike and actually fall toward its target. Thus, the effective range of a downhill strike may exceed that normally expected across a level surface. Caves and deep crevices on rocky hillsides are common hibernaculums for rattlers. Many species hibernate in groups. Rodent burrows are probably the most common places for sleeping snakes, especially in southern states such as Texas. Other places include holes under the roots of a tree or inside a rotting log. Barns or under houses are other good spots for snakes. Not all snakes will survive hibernation. A skinny snake will not survive. If the snake feeds heavily before they hibernate, and have digested their meal before the cooling starts, they will be OK. If food is in their stomach or intestines when they cool, it will rot and kill them. Snakes are most active whenever temperatures are between 80-90F. This means that the snakes may be active most of the day during the spring, and during the early mornings and late afternoons throughout the summer. Exposure to temperatures above 110F for more than a few minutes is enough to kill a rattlesnake; therefore, during the hottest part of summer, snakes are seldom observed, except occasionally at night. Snake activity picks up again as temperatures begin to fall in late summer and early autumn before they go into hibernation or brumation. 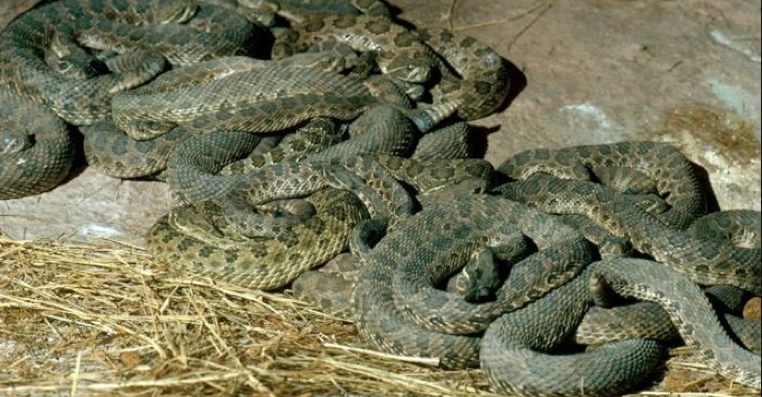 An estimated 45,000 people are bitten by snakes annually in the United States. Approximately 8,000 of these bites are from venomous snakes. It is estimated that snakebites account for 125,000 deaths worldwide each year. Those statistics are enough reason to always wear snake boots or snake gaiters when in snake country, which could be the desert or the woods. If you do, you won't have to worry so much about the temperature or the season because if you use common sense and wear snake bite protection, you'll keep yourself safe.